Arbitrage is not really about arbitrage, the practice of taking advantage of a price difference between two or more markets. 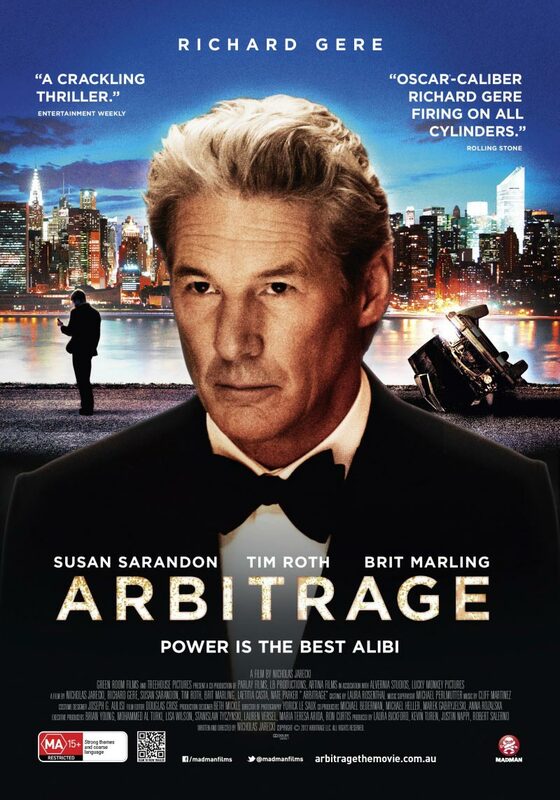 And it’s not even about the self-serving gains and devastating effects on others of the underhanded and shady dealings of the star, a venture-capital plutocrat (Robert Miller, played by Richard Gere). No, Nicholas Jarecki’s film is about how everyone else—from Miller’s wife (Ellen, played by Susan Sarandon) and daughter (Brooke, played by Brit Marling) to his mistress (Julie Cote, played by Laetitia Casta) and a cast of others (the lawyers, the kid from Harlem, the guy who lends him money, the other guy who ultimately buys him out, the participants in the charity dinner, and so on)—makes it possible for Miller to conduct his business and his life as a high-flying venture capitalist. And they all make sure they get their cut of the surplus for doing so. It is, in other words, a perfect film for our time—a representation of plutocratic virtues. *The title is, of course, a play on Deirdre McCloskey’s The Bourgeois Virtues: Ethics for an Age of Commerce, which I am teaching this semester as a companion to Adam Smith’s The Wealth of Nations.